"From atop these pyramids, forty centuries look down upon you." Though the three Great Pyramids are the most famous and prominent monuments at Giza, the site has actually been a Necropolis almost since the beginning of Pharaonic Egypt. A tomb just on the outskirts of the Giza site dates from the reign of the First Dynasty Pharaoh Wadj (Djet), and jar sealings discovered in a tomb in the southern part of Giza mention the Second Dynasty Pharaoh Ninetjer. But it was the Fourth Dynasty Pharaoh Khufu (Cheops) who placed Giza forever at the heart of funerary devotion, a city of the dead that dwarfed the cities of the living nearby. His pyramid, the largest of all the pyramids in Egypt (though it should be noted that it surpasses the Red Pyramid of his father Snefru by only ten meters) dominates the sandy plain. On its southwest diagonal is the pyramid of his son Khephren (Chephren, Khafre). Although it is smaller, a steeper angle results in the illusion that they are the same size. In fact, Kephren's pyramid appears taller since it is on higher ground. The notion that this was done on purpose to out-do his father is without question. As it occupies the central point, has the illusion of greater size, and still has some of its casing stones intact, it is frequently mis-referred to as the Great Pyramid, something that would no doubt please Khephren were he to know about it. Further along the southwest diagonal is the smallest of the three, the pyramid of Khephren's son, Menkaure. It is also the most unusual. First of all, it is not entirely limestone. The uppermost portions are brick, much like the several Pyramids at Dahshur, though separated from them by several centuries. One theory is that Menkaure died before his pyramid could be completed, and the remaining construction was hastily done to finish in time for the burial. It is also not along the diagonal line that runs through the Great Pyramid and the Second Pyramid, but instead is nearly a hundred meters to the southeast. This error, if error it is, is of a magnitude not in keeping with the mathematical skill known to have been possessed by the ancient Egyptians. However, an idea has emerged in the last few years that the three large pyramids of Giza are actually meant to be in an alignment resembling that of the three "belt" stars in the constellation Orion: Alnitak, Alnilam, and Mintaka. This theory is largely discounted by the majority of Egyptologists, but some do believe it is a point to ponder. Giza can be subdivided into two groupings of monuments, clearly defined and separated by a wadi. The larger grouping consists of the three "Great" pyramids of Khufu, Khephren, and Menkaure; the Sphinx, the pyramids of the queens, attendant temples and outbuildings, and the private mastabas of the nobility. The second grouping, located on the ridge to the southeast, contains a number of private tombs of citizens of various classes. While the majority of the monuments of the larger grouping are made from limestone that was quarried and transported to the site, the tombs of the smaller grouping are simply carved out of the native living rock. 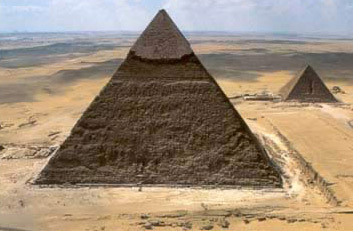 All three pyramids stand empty, possibly plundered during the political unrest that ended the Old Kingdom when the monarchy collapsed. Yet there are the occasional surprises. Airtight pits along the southern and eastern walls of Khufu's pyramid are believed to contain boats (not small ritual boats, but fully-functional funerary barges with 40-ton displacements, one such was excavated in 1954); and most recently, evidence has been found of a tunnel linking a hidden chamber within the Great Pyramid with a previously unknown chamber beneath the Sphinx. What treasures and discoveries lie within these areas remains to be seen, but it is hoped that the wait will not be long. The advantages of Giza for a burial site are numerous, and it is fairly easy to see why it was chosen. It is high and flat ground overlooking everything. Any monument placed there would be seen from far away, especially if traveling via the Nile. It also has a ready supply of limestone on-site, eliminating the need to transport the blocks over a protracted distance. Since around the Fifth Century BC, and up until recently, stone from the monuments were taken and used to build buildings in nearby Cairo. First the polished white limestone "casing" was taken, then the softer core stones. Many of Cairo's oldest buildings are built partly from stones from the pyramids. This destruction continued well into the Nineteenth Century until preservation efforts and a resurgence of national pride put a stop to it. It is believed that had the pyramids not been vandalized, that they would still remain to this day much as they were when they were built. As the saying goes, "Man fears Time, but Time fears the Pyramids." Exactly how big Giza is may never be known. Excavations have continued to find new tombs and artifacts since Bezoni, Caviglia, Perring, and Vyse began the first systematic study of Giza in the early 1800s. It has been explored and excavated more thoroughly than any other site in Egypt, possibly more than any other site in the world, yet no one believes it is anywhere near completion.